Eight hundred years ago, Ys was a land of peace and prosperity. Rules by two beautiful goddesses and six priests, Ys was a world of magic. Magic that came from a mysterious stone called the "Black Pearl." Using this stone, and the magic that it had given them, the priests created a new metal, "Cleria," which brought great riches to the land. But one day, a great evil came across the land. Believing that it was the Cleria that caused the evil, the priests buried all of it in hopes that the evil would disappear. The sacred shrine, Solomon, which held the Black Pearl, was raised high in the air to prevent it from being destroyed. 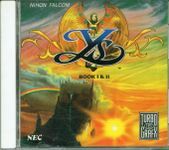 Fearing the worst for themselves, the priests wrote down the history of Ys in six separate books and passed them on to their descendants. Years passed, and Ys fell into a deeper state of despair until, one day, the buried Cleria was found. For a short time, the peace and prosperity that had existed 800 years before was returned to the land. But, just as before, an Evil Force appeared. Once again, the land seemed doomed. But this time, there was one small ray of hope. This hope was a young man named Adol. Adol heard that whoever found the six lost books of Ys and returned them to the statues of the now long-gone priests, could restore the country to peace and prosperity. It was rumored that five of the books had been hidden throughout the land. However the sixth book belonged to an evil Demon Boss called "Dark Fact" who lived in Darm Tower. It was said that Dark Fact would fight to the death to preserve this book. Brave, Intelligent and true, Adol sets out on what will be the adventure of his life. But it is you, great adventurer that must guide him.